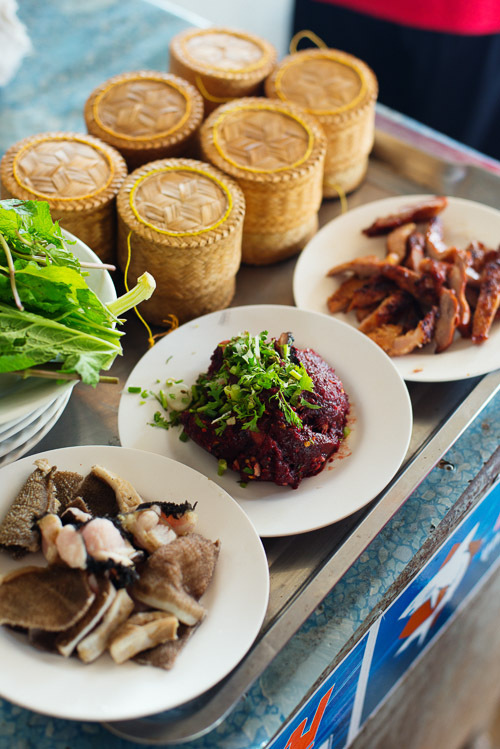 Phrae, a little-visited town in northern Thailand, is probably the region's most famous place for laap and other meaty, northern Thai-style dishes. 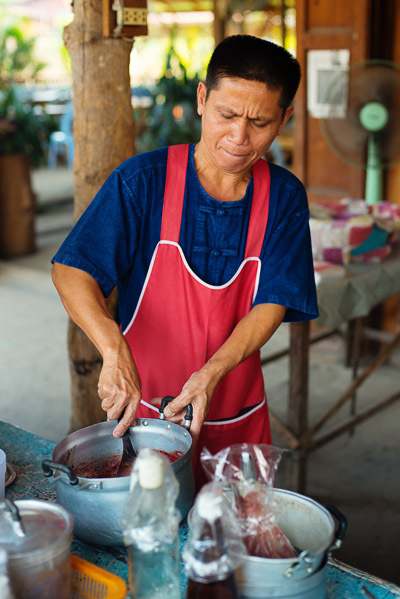 Yet the glowing rep has meant that many of the town's cooks have opened shop elsewhere in northern Thailand, and today most restaurants with the name Laap Phrae are found far outside the tiny town's city limits. Jin Sot is northern Thai for fresh meat, an apt name for this open-air restaurant that serves an entire repertoire of northern Thai-style dishes -- many served raw -- made from pork, beef and buffalo. 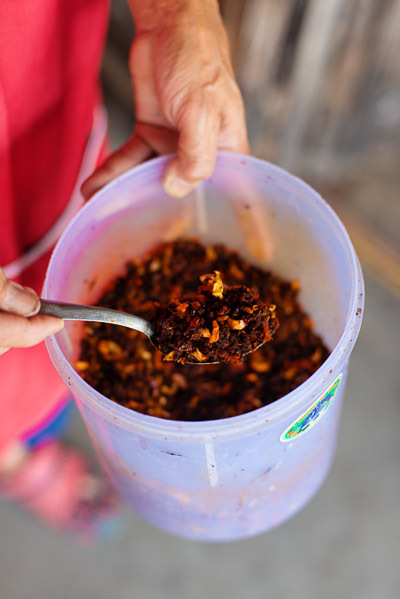 Dishes such as laap, a "salad" of minced meat, can be found across Thailand's north, but according to Mr Kanka, the thing that makes them particularly Phrae is the khrueang, or chili paste. 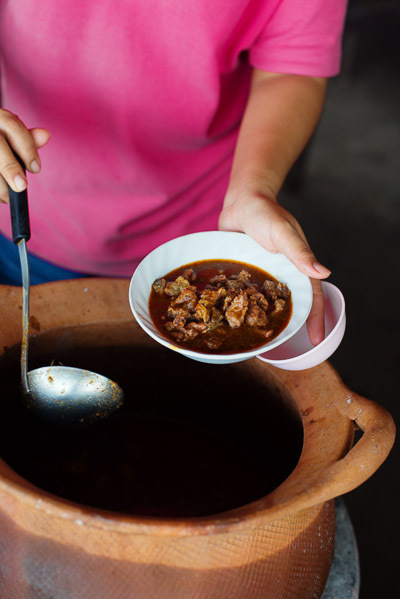 “The chili paste is the same everywhere: chili, garlic and shallots; the flavour depends on how the dish is seasoned," explains the native of Phrae. "Here we use lots of makhwaen [Zanthoxylum limonella Alston; a spice related to prickly ash and Sichuan pepper], deeplee [long pepper] and malaep [Heracleum siamicum Craib; a local spice]." 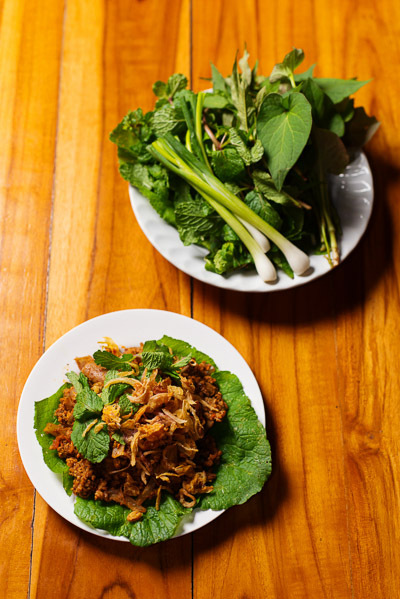 a dish of finely minced pork, offal and that spice mixture (unlike elsewhere in northern Thailand, blood does not feature in the cooked version of this dish), briefly fried and topped with fresh herbs and no small amount of deep-fried crispy shallots (they sometimes do a unique local variant called that also includes tart cherry tomatoes). Like elsewhere in Phrae, the dish is spicy -- surprisingly so for typically mild northern Thai food -- yet also packs the fragrant, slightly numbing punch of makhwaen and the citrusy zing of malaep. "It’s hard to make," explains Mr Kanka, who explains that in addition having to prepare the obligatory sides of crispy deep-fried noodles, pork intestines, pork rinds and kaffir lime leaves, he also has to take great care with the dish's main ingredient ("The blood has to be very fresh, and as soon as we get it, it has to be kept cool."). 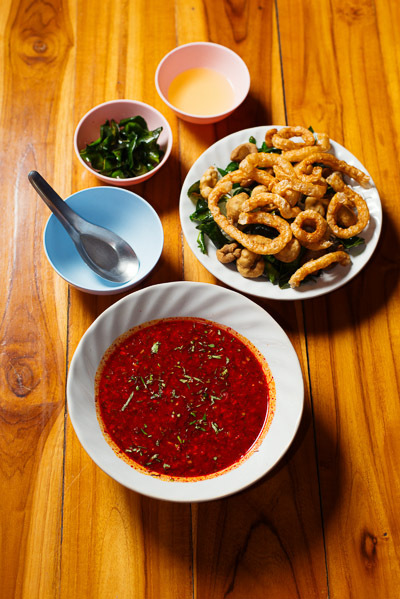 To serve the dish, the blood is mixed with the spice paste, cooked minced pork, the liquid from picked garlic (“for sweetness”) and sweetened condensed milk (“for a sweet and oily taste”), before being served over the noodle mixture. It's an undeniably intimidating but delicious dish, a unique combination of herbal spiciness, meaty savouriness, soup and crunch. a rich, thick, intensely meaty stew.